Each surfboard tells a story. It comes from decades of inspired surfboard artisans evolving designs and construction methods. I am a part of this evolution and when I make a custom surfboard, I like to take this long history and bring it into the surfboard making process. I discuss the board with the customer and imagine the customer riding the board in their target conditions and make a board to suit. I keep the customer involved in the process by sending photos and updates as to how the surfboard is coming along. Or even better, I like customers to come to my factory and contribute to making the board, so I can pass all I have learned to them. 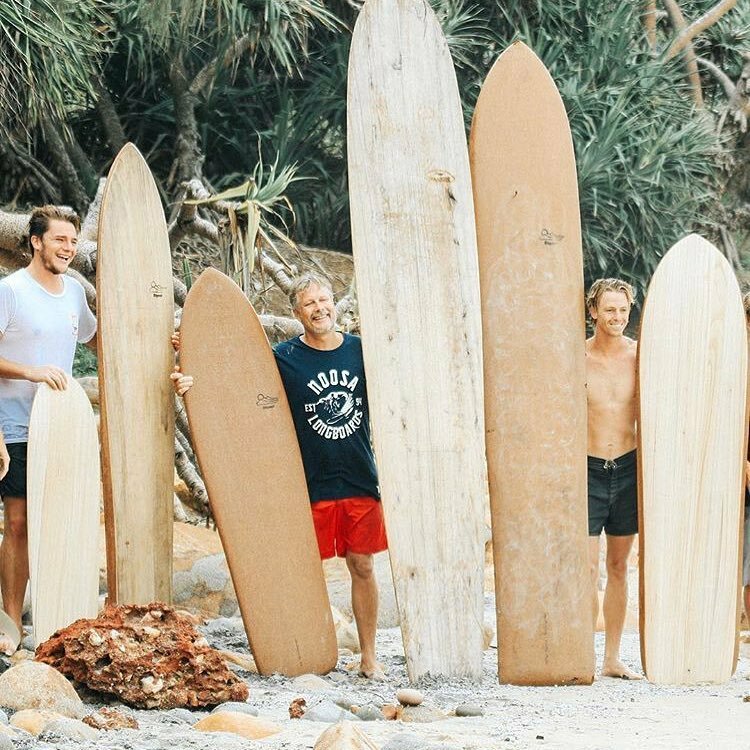 In 2013, Tom took a break from making surfboards to attend the University of the Sunshine Coast and write a PhD on the sustainability of the surfboard industry. He found that the amazing resiliency of the surfboard industry has come from its unique culture which has been passed down from generation to generation. Tom has turned his PhD thesis into a book, “Surfboard Artisans For the Love,” which is available here. Since finishing his thesis, Tom has returned to making surfboards. Come and made a surfboard with me and become one of the family for a few days. We have made the Wallace Room, a guest room just for visitors making surfboards. Immerse yourself in the construction of your surfboard and the culture and history surrounding the board. I have been making surfboards and working in the surf industry since 1979. My passion is to learn about different surfing cultures and the surfboards they created. I have studied and made every surfboard I have learned of including: Ancient Hawaii olo and alaia, Tom Blake inspired toothpicks, Waikiki planks, noseriders, guns, fish, hot curls, gliders, and all sorts of bellyboard designs from around the world. Please see my story. Tom Wegener is arguably the most cutting edge shaper in the world. He started the alaia revolution in 2005 and was named Surfboard Shaper of the Year in 2009 for this. Then he took the dynamics of the alaia and applied them to modern materials and designed the Seaglass Project Tuna and Albacore boards made by Global Surf Industries and retailed to surfers all around the world. In 2016, Tom developed a way to incorporate flex through paulownia and cork woods into his finless boards to create the next level of finless surfing. Tom was a key inspiration for the wood board movement. In 2001 he discovered that paulownia is the best wood for surfboards because of its highly unusual property of not sucking up salt water. In 2003 Tom stopped making foam surfboards and turned only to paulownia wood and made over 300 hollow wood finned surfboards. (Also, the alaia revolution was possible because Tom’s work with paulownia). Tom is most proud of his green factory which has no toxic chemicals and almost no waste. In 2011, Tom was awarded the Sunshine Coast “Smart Business Award” for his environmentally friendly factory. In 2013, Tom took a break from making surfboards to attend the University of the Sunshine Coast and write a PhD on the sustainability of the surfboard industry. He found that the amazing resiliency of the surfboard industry has come from its unique culture which has been passed down from generation to generation. Tom has turned his PhD thesis into a book, “Surfboard Artisans For the Love,” which is available through this website. Since finishing his thesis, Tom has returned to making surfboards. Tom started shaping surfboards in 1979 and his brother Jon took up the planer a few years later. Working together Tom and Jon have developed many surfboards and are still working together. Jon is in Encinitas, California while Tom moved to Noosa Heads, Australia in 1998.